We follow Dr. Carmen Battaglia’s recommendations and the studies he cites in order to “breed better dogs” (which is quite appropriately the name of Dr. Battaglia’s webite) by following his Bio-Dog program. The first period of stimulation involves a small window of time in puppy development that begins on the third day of life and lasts only until the sixteenth day before closing forever. During this time there is extremely rapid neurological growth and development which is of great importance to each individual puppy. Each day I start by weighing the puppies following their breakfast nursing session. I record this so that we can track each puppy’s growth. This is how we know every puppy is thriving and no one is getting pushed off the milk bar too often by bigger, stronger siblings. 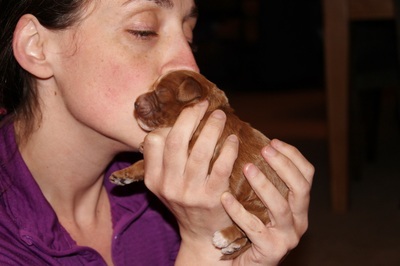 I also measure the length of each puppy from nose to the base of the tail. Then I handle every single puppy. 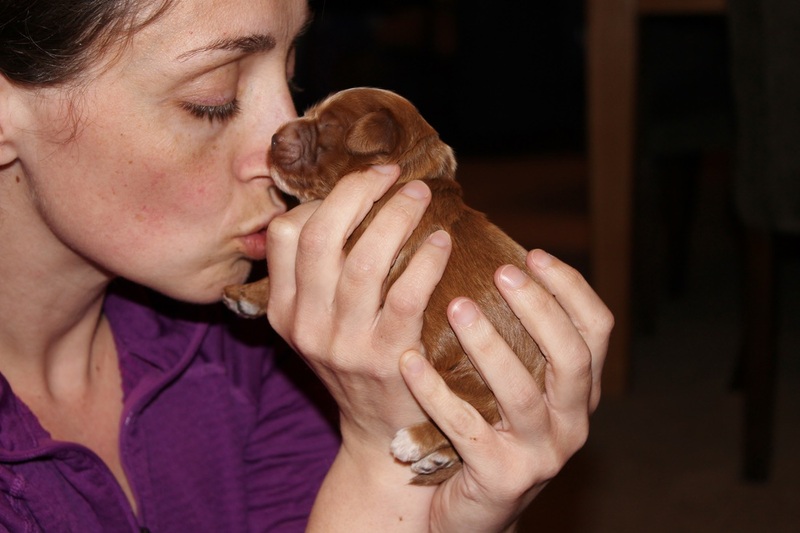 I start by carefully examining the puppy with both my eyes and my fingers to ensure the puppy is growing well and has no lumps and bumps, injuries or infections anywhere on the tiny body. I check the umbilical cord stump to ensure proper healing and I look in the ears and at the eyes to make sure everything is going according to plan. Bottoms and nails are checked as well (puppies with sharp nails will hurt Mama while kneading during nursing. Then I begin the earliest of socialization with people. This includes gentle cuddling, stroking and secure handling so they feel safe and warm and don’t cry for Mommy. During this time I put my face close to their little heads and talk softly to them or say "shhh" at them. They always calm right down when I do this, they like the shushing especially. They seem to like the breath in their little noses and generally start giving kisses or yawn and fall asleep. While they can’t hear my voice they can certainly feel the vibrations and smell my people-smell. The puppy may be passed along to a child who will undoubtedly give lots of kisses and tender pets. Momma dog is usually sitting right there monitoring her baby, but sometimes she just lays down to chew on a bully stick and have a break while we “puppy sit” for her. 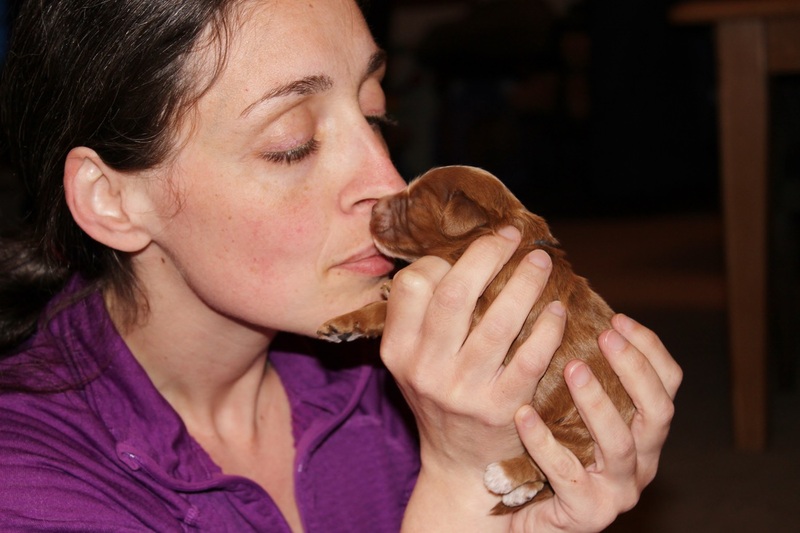 For neurological stimulation each day every puppy has a few brief experiences. I provide “tactile stimulation” (meaning touch). This is done by gently handing the paws and each toe and even tickling in between the toes with a q-tip. I hold the puppy with his body vertical, the way a person stands up. And I might dip them so that their little nose points right to the ceiling for a few seconds. Then I gently and securely hold the puppy with his head pointed down towards the floor for a few seconds. Some puppies strongly object to this exercise. 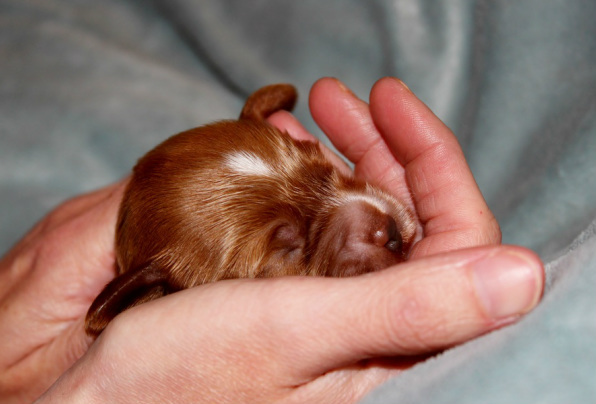 · Then I cradle the puppy gently on her back in a supine position for a few seconds. Some puppies object to this one too but most of our cockapoo puppies don’t seem the slightest bit perturbed and will even fall asleep. And finally I provide a surface to lay the puppy on that has a dramatically different temperature than their warm whelping box or the ambient air. This can be accomplished with a surface that has been put in the refrigerator or freezer or has had frozen-freezer packs placed on it for several minutes prior. I like to rotate the surface I use and the temperature of the surface each day. Sometimes I'll use a slick metal surface (like they'll have to tolerate at the vet hospital or groomer's) or other times a textured surface. The surface of the object is never frozen or terribly cold because the puppies are so little and have very little fur to protect themselves. The puppies are not restrained from moving or walking off the surface. This is only done for a few seconds and it is the final step in the program. When done the little one is returned to the warm whelping box to nurse and get a bath from Mommy.